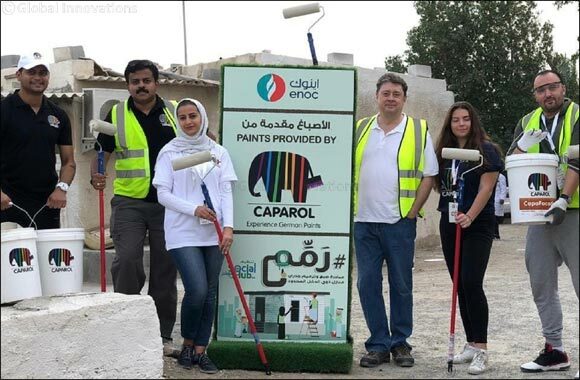 DUBAI – January 07, 2019: Caparol Paints, a global provider of German paint and coating solutions, has completed an initiative to bolster the lives of less fortunate families in Dubai by renovating their houses. In partnership with ENOC and Social Hub, the initiative covered painting and renovation of houses of 30 families residing in Al Awir area. Around 1000 volunteers rolled up their sleeves for a day to help refurbish the homes of the needy as part of the initiative. The campaign included painting walls and some house technical repairs and improvements. Caparol Paints has been a faithful painting partner for millions of customers around the world for more than a century, and this initiative is part of placing high priority on serving the best interests of society to make a real difference to people and the world. “We implement our social responsibility programs with a deep understanding of the communities and the environment in which we operate. By collaborating with local governments, business partners and non-profit organisations, Caparol Paints is committed to localised programmes that inspire hope and empower individuals, families and communities to improve their lives in a sustainable way,” he added. Caparol Paints offers a comprehensive product range, attention to detail, years of tradition and sustainability that determine its core values. The development of every single product at Caparol adopts years of tradition and values. The products are developed by Caparol’s technical experts based on extensive research into everything consumers want.